Alton Towers is one of the U.K.’s top family theme parks with rides and attractions for all ages. 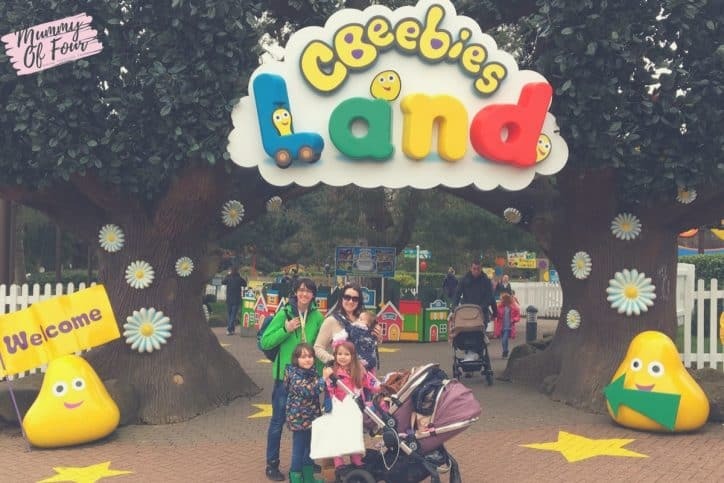 In recent years, the addition of CBeebies Land has made the park very popular with my little ones. If you’re visiting as a family, you want to make sure that you are maximising every moment of your day. 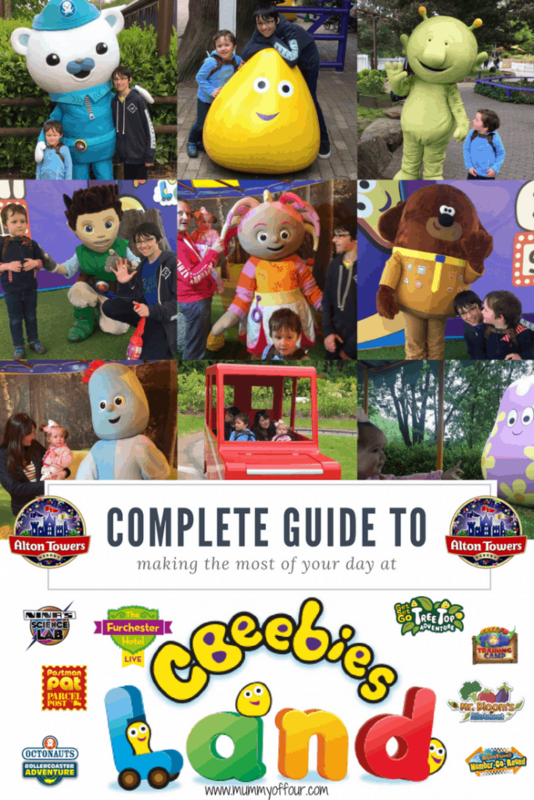 In this guide I’m going to tell you exactly how to make the most of your visit to CBeebies Land at Alton Towers. 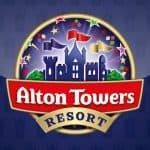 If any of your family have additional needs, I will also be telling you just how accessible Alton Towers really is. 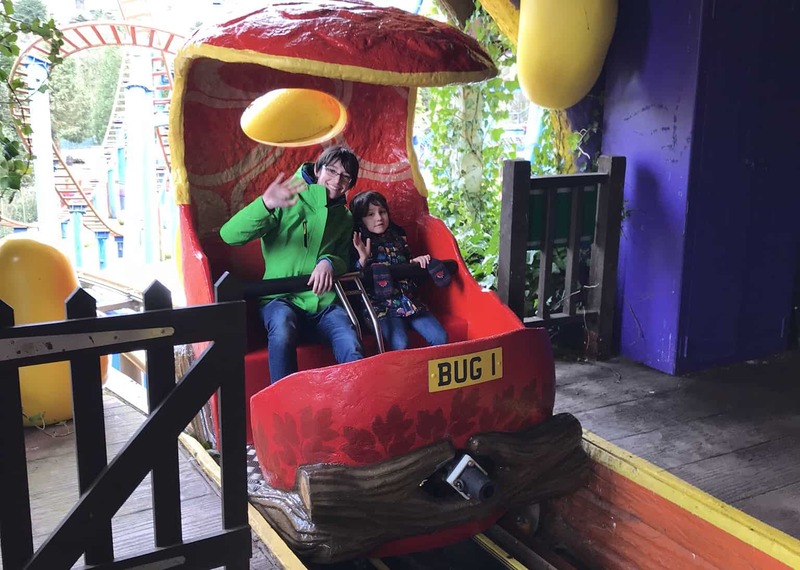 Don’t forget to check out the video walk throughs of the rides in this post, so that you and your little ones will know exactly what to expect from your trip. 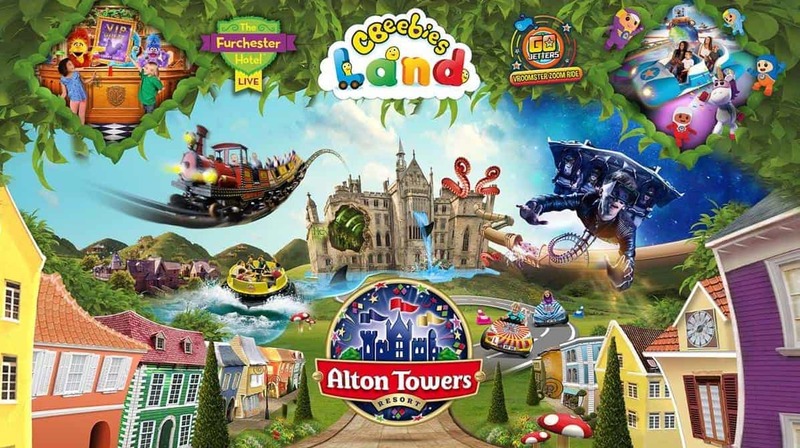 Tickets for Alton Towers can be bought in advance online. Always have a quick google for any offers that they are running before you go. 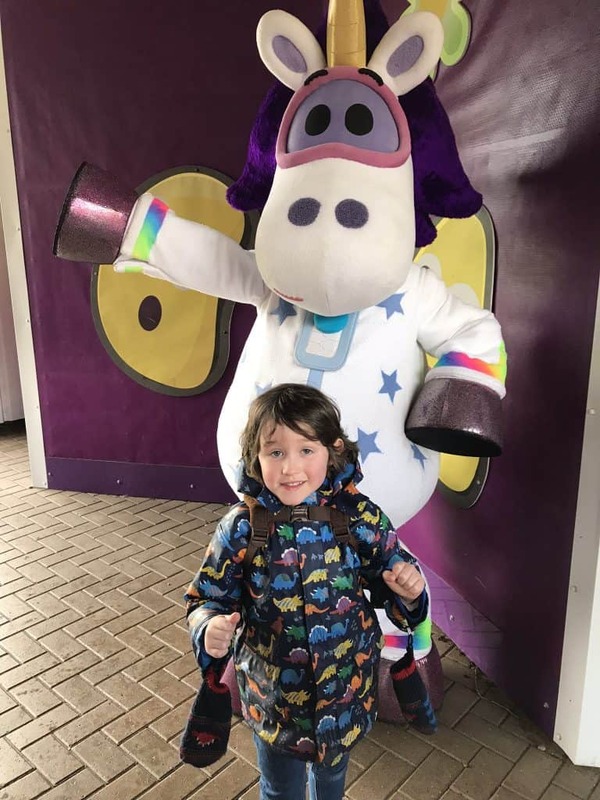 You can choose between day tickets, season passes, all Merlin annual passes which also give you access to over 30 additional attractions across the country including Chessington, Thorpe Park, and Legoland at Windsor. If you collect Tesco Clubcard points, it can be really good idea to swap these for tickets to get into the park or even Merlin annual passes. On our last trip, I exchanged £100 of Tesco Clubcard vouchers for 2 Merlin annual passes which should have cost £179 each. Ordering and uploading photos for your Merlin annual pass online before you go. Measuring your children before you arrive at the park to avoid having to measure them at a specific ride. This will enable you to see which rides they are tall enough to go on before you arrive, avoiding unnecessary disappointment on the day. Planning which rides you really really want to go on before the visit. Make sure you download the Alton Towers app to your phone before you go. This can be used to plan which rides you want to make sure you fit into your day, Plus can be used to queue times when you arrive. I would highly recommend downloading BBC iPlayer kids up to your children’s iPad for the gym in the car journey there, and filling it up with all of the CBeebies programs that have rides for shows in CBeebies land. These include the Octonauts, Tree Fu Tom, Postman Pat, the go Jetters, In The Night Garden and Something Special. The best thing is, the app and the shows are free to download and watch offline. 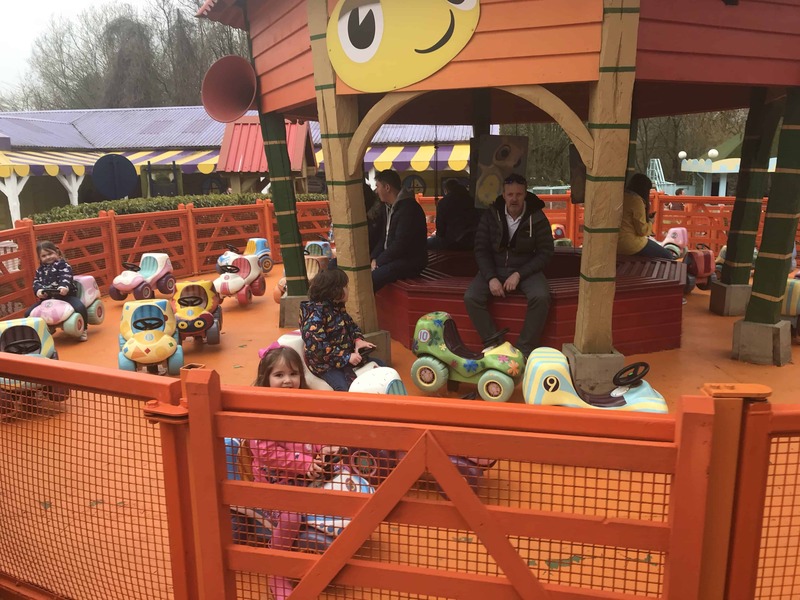 If any member of your party has additional needs, that may make queueing difficult, Alton Towers and provide the ride access pass which will avoid or dramatically reduce QA. 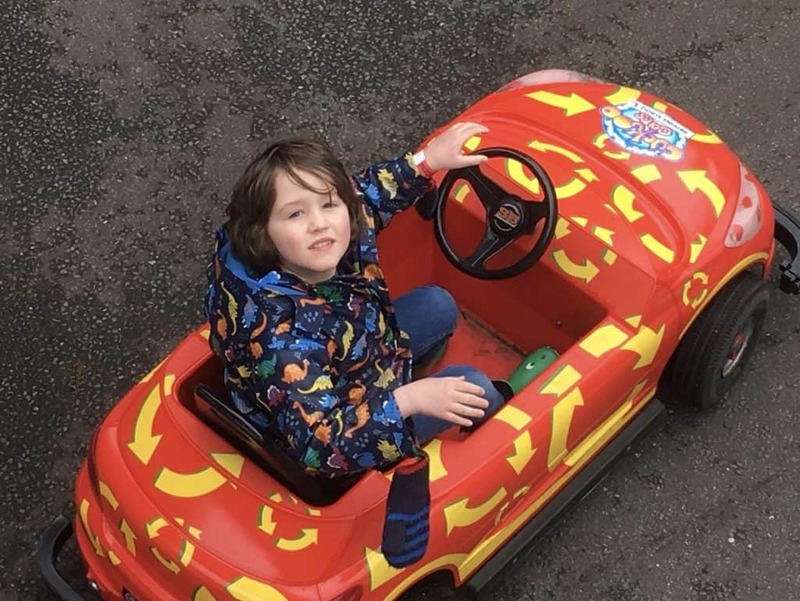 How are younger son William has autism, so we took a letter from the GP with us, stating that his autism makes queueing very difficult for him. This along with photo ID in the form of his passport meant that we were able to obtain the red band when we arrived. It is very important to gather these documents with you before you go in order to obtain the red band. Visitors with certain disabilities, Alton Towers provide a free carers ticket to go along with every for paying disabled gassed. For full details of all of the disabilities covered and the documentation that Alton Towers: enquiries you to take with you to obtain either a ride access pass or carers pass please visit the Alton Towers of accessibility page. 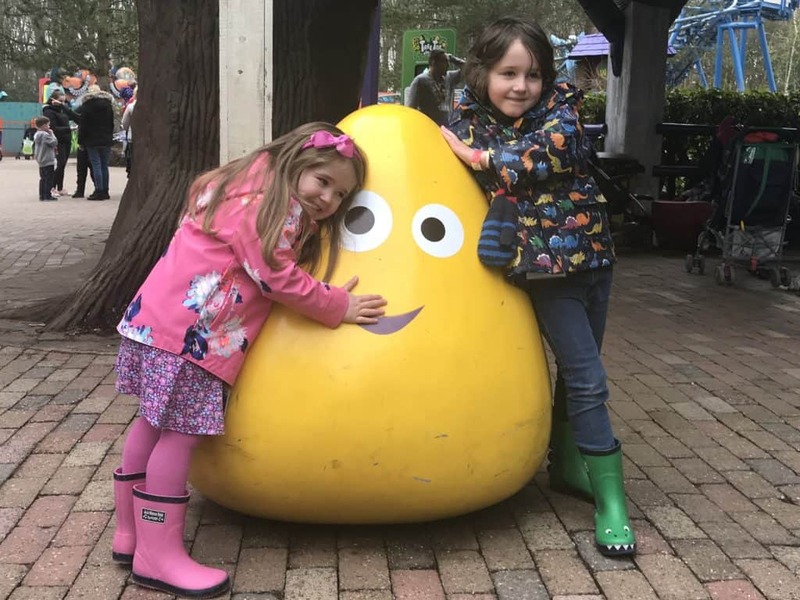 For our last visit to Alton Towers, we went the Tuesday after the bank holiday during the Easter holidays. On the first day we opted to the standard parking priced at 6 pounds per day, and got the monorail into the park. In spite of the fact that it was absolutely pouring with rain, the park was crazy busy and the queue for the monorail both in and out of the park took absolutely ages. Unfortunately, the monorail is one of the queues that the right access pass cannot help you bypass, so as you can imagine our little boy with ASD became quite anxious. On subsequent days we chose to upgrade to express parking and bypass the monorail. Express parking is priced at £16 today and I really believe but the extra £10 pounds per day is well worth the body in order to avoid the monorail mayhem and spend more of your valuable time enjoying yourselves in the attractions. Like I said, on that Tuesday when we arrived in the park it was pouring with rain. As I had a reasonably complicated set of tickets to arrange, one being a disability ticket, one being a carer’s pass, and to Merlin annual passes being paid for by Tesco points, I did not have the option to purchase everything online in advance and simply scan the barcode on my phone and walk through the turnstile. I did have to stand in quite a long queue in order to arrange these tickets, but Daddy of Four was able to walk around with the children and keep them reasonably entertained cut that this while I waited. William did need to join me when I reached the front of the queue so that he could be identified to organise his disability ride access pass and my carers pass. They also had to put the red band directly on his wrist as their company policy says that they can’t just be handed out without being fixed directly onto someone. If your child would find it very distressing to where the band themselves, however, they will allow a parent or carer to work in their place. However both the disabled person and the person wearing a red band must ride every time you want to jump the queue, so take this into account when choosing who wears the band. Ride access pass will be needed for each individual day of your visit. The past comes in two parts, the red band and the piece of paper with the daytime it. As long as the red band (which is waterproof) is not removed, you can request a separate paper part of each day you plan to visit on your first day, meaning you will only have to queue once. On subsequent days were we already had on Merlin annual passes, we were able to go directly to go through the turnstiles. The second day that we went through, the whole queueing system to get in was a little chaotic. 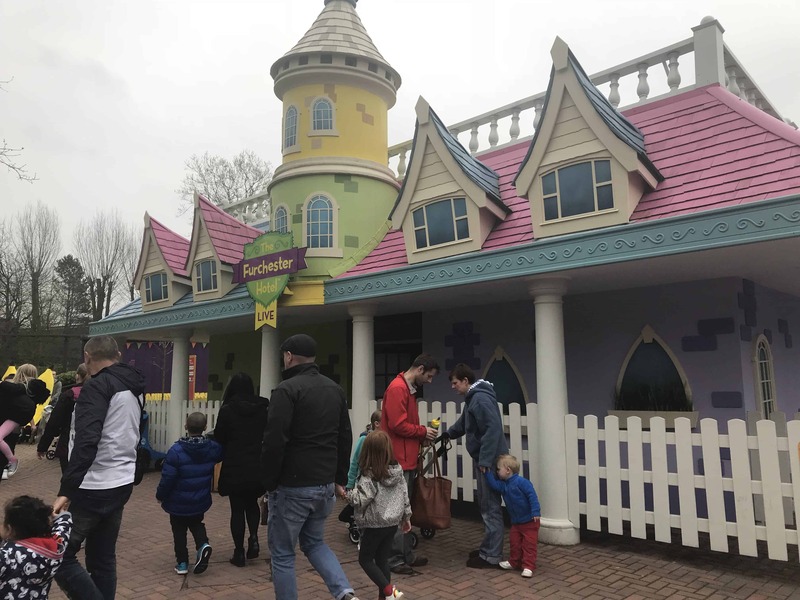 Although there were signs that said Merlin passes here to go into a separate queue, there are number of quite inexperienced members of staff ushering everyone into all the wrong places. So the first two days of our visit, queues before we got into the park were really quite bad. Strangely on the Friday and Saturday, even though the weather was better the park in quieter and the queues were not nearly as bad. The series you arrive at the park find out the show times and the times at which the characters that you would like to meet will be out as well is exactly where they will be. Make sure that you factor time into your days so that you don’t miss the characters that your children are really looking forward to seeing. You can buy either daily or annual photo passes which will get you unlimited digital Photos while you are in the park. The day that we bought ours, we purchased to annual Photo passes that can be used across the Merlin Merlin attractions at a discounted price of £60. These can be purchased from the photo shop on the left hand side tower street as you into the park. 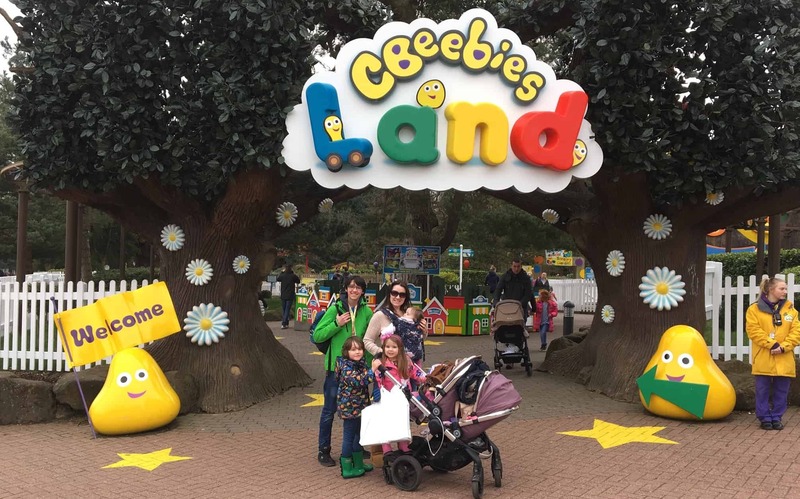 These passes enable you to collect digital copies of your photos from all of the rides that offer pictures, plus the CBeebies photo studio, so we felt that they were good value. You can download the free Pic Solve app to view all of your digital photos from the park. 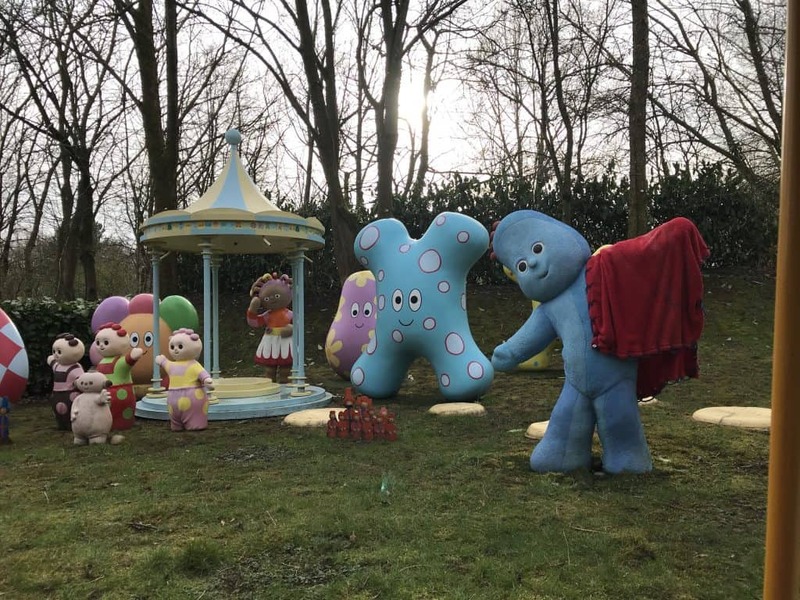 As you enter the park via the main entrance CBeebies Land, where I’m sure your children will want to spend most of their day, is to your right. 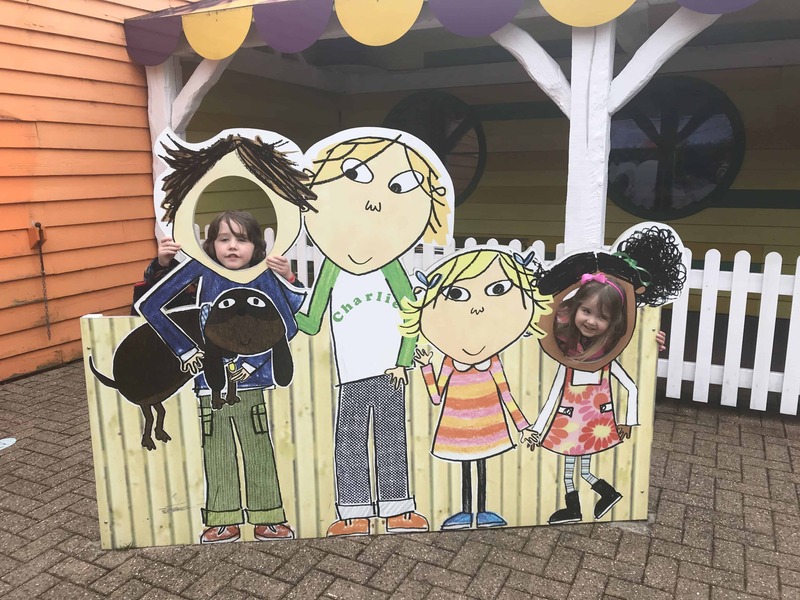 There are plenty photo opportunities within CBeebies land, so have your camera at the ready to make sure you get plenty of snaps of your children with all of their favourite characters. The Get Set Go Treetop Adventure is a really good right to start with. It is suitable for all ages, with up to 3 passengers allowed per CBeebies Bug carriage. 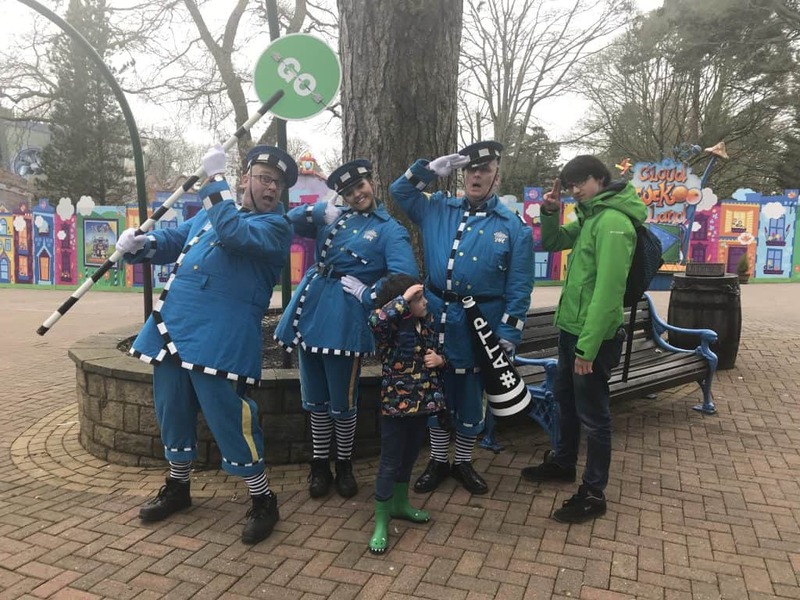 The right takes you on a journey over CBeebies Land so that your children can see everything that CBeebies Land has to offer and you to get your bearings. 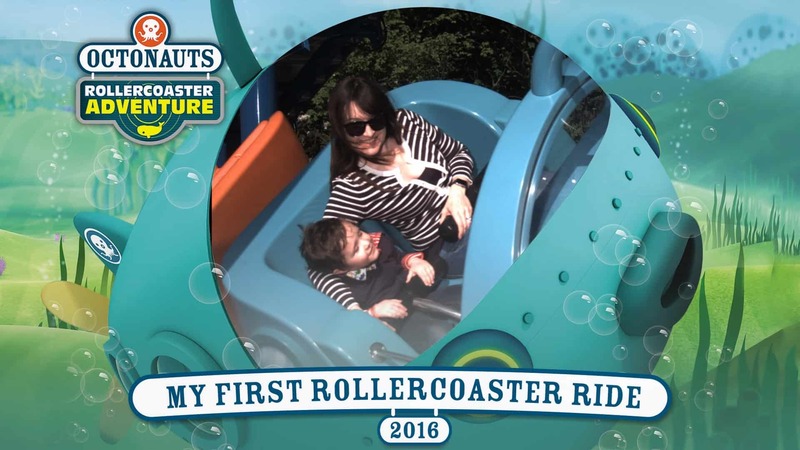 Beyond the Get Set Go Treetop Adventure is the Octonauts Rollercoaster Adventure. 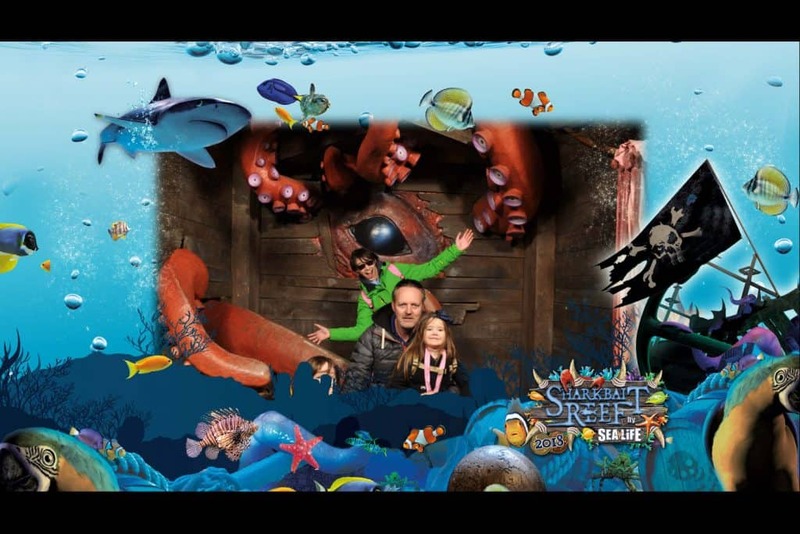 This ride is suitable for children over 0.9 m tall and my little ones absolutely loved it. The ride is fast enough to be quite exciting without being quite as terrifying as some of the larger rollercoasters in the rest of the park. The ride whizzes twice around the track through bubbles and even whale squirting water in your face. Don’t forget to get hold of your photographs from as you exit the ride. 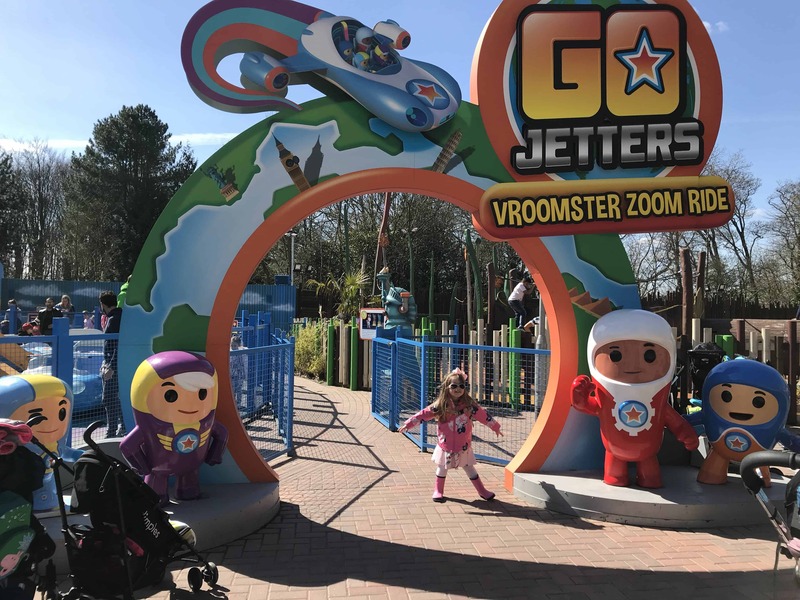 The Go Jetters Vroomster Zoom ride is another one suitable for children once they reach .9 m tall. Up to 4 passengers, two in the back in the front can ride round and round the world in a Go Jetter’s Vroomster spaceship. The passengers sitting in the front are able to “drive” the Vroomster up or down with the controlling lever. There are no photographs available to purchase this ride. 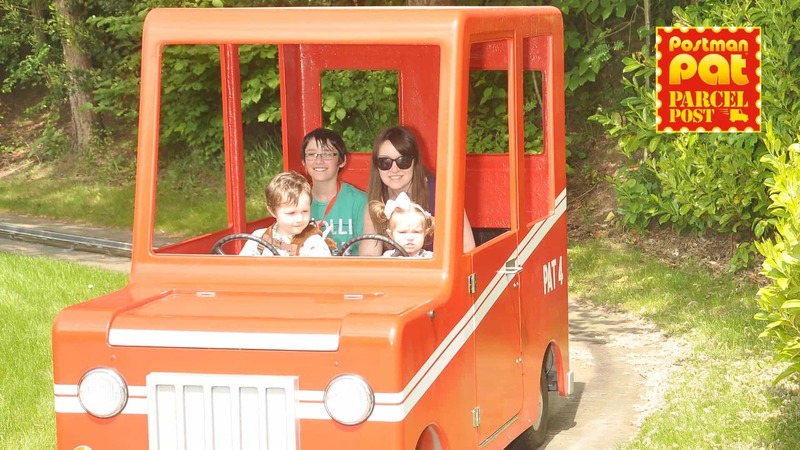 The Postman Pat ride allows four passengers (two in the front with steering wheels and two in back) to take a drive around Greendale and deliver some parcels with the push of a button. 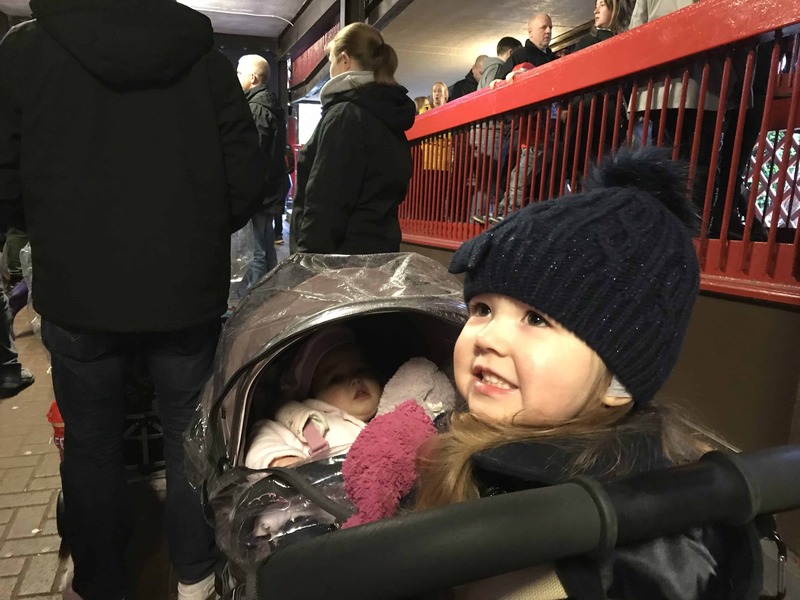 This ride is suitable for all ages and was especially popular with Zara who was just 14 month old at the time. The photographs taken in this ride are available in the booth opposite exit. 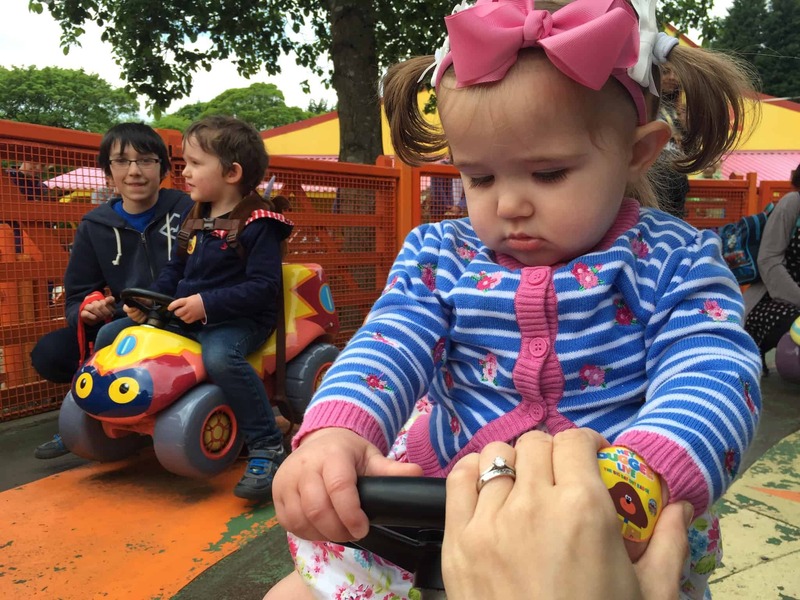 The NumTums Number Go Round is a large and very gentle merry-go-round type ride where children sit on small brightly coloured ride on vehicles and can easily be supervised by parents. This ride is suitable to children of all ages. This is not the most exciting of the attractions, but is nice and gentle for very small children. The In The Night Garden Magical Boat Ride was a firm favourite with my little ones. Your boat journey takes you through the Night Garden to meet all of the familiar friends and sing along with their songs. Make sure you take your own pictures because there is no photograph available to purchase on this ride. Each boat is quite large, six of us fit comfortably in one with more room to spare. This ride is suitable for children of all ages. Is a large partly covered Astroturf area and shows running three times a day. During our first visit they had we saw a Hey Duggee, a Tree Fu Tom and a Zingzilla show. 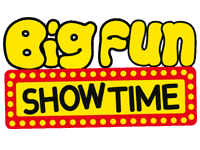 During our more recent visit they were still running the Hey Duggee and Tree Fu Tom, but the Zingzillas had been replaced with a Big Fun Showtime show that we didn’t get around seeing. The showtimes are posted at the entrance or the attraction, so make sure that you check them out and fit them into your day. There is a small amount of cover if the weather is poor, but most of the area has no roof. In good weather, it’s a great place to picnic while watching the show. There is an area over to one side of The Big Fun Showtime where you can queue to meet characters. There are also Mike the Knight challenges that can be completed in another area of the enclosure. Mr Bloom’s allotment is a really lovely interactive show experience. Children are greeted by one of the gardeners and told Mr Bloom has gone on holiday. The children and the gardener host then face-time Mr Bloom who gives him who gives the children some jobs to do around the allotment. Children are asked to collect things to feed “Comp-o” the compost-arian before being taken inside the shed. There is no photography allowed inside the shed the children will get to meet the veggies in a really beautifully put together show. They even get to sing the “night night veggies” song at the end. 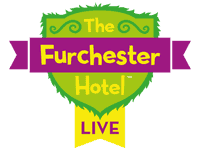 The Furchester Hotel is another really lovely interactive show experience that you must not miss during your visit CBeebies. 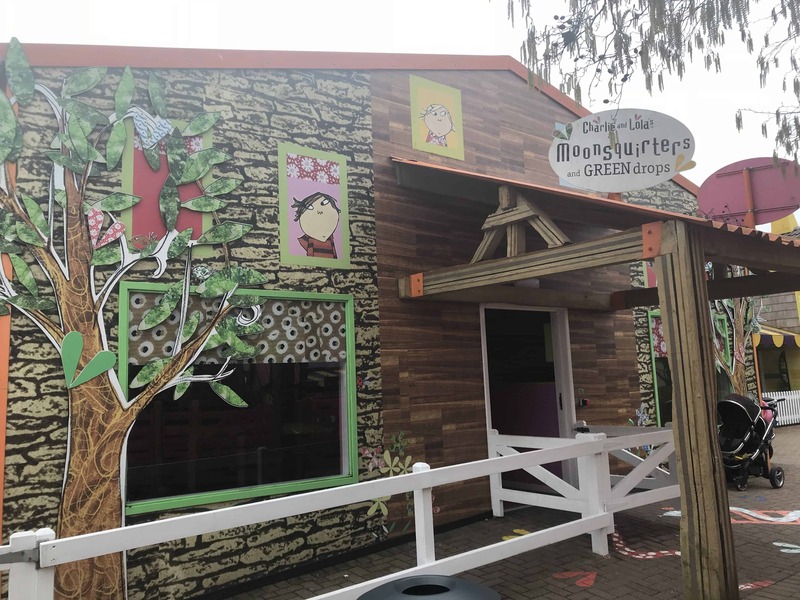 Much like Mr Blooms Allotment, there is no photography allowed inside but the 15 minute show has your little ones getting involved singing and dancing along with Funella, Pheobe, Fergus Isabel, Cookie Monster and Elmo. Shows ran every half an hour throughout the day. Meet Mr Tumble (a video of him, anyway) as you take a stroll through the Something Special Sensory Garden. 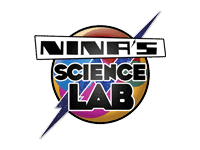 Nina’s Science Lab is a single room full of lots of hands-on science fun your little ones to get involved with. Your little explorers can learn about many aspects of science in this multi-sensory experience. Bonus points for this one as it is both indoors and not a queueing attraction. 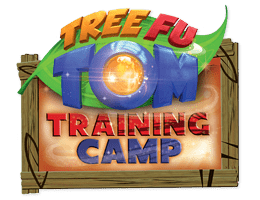 Tree Fu Tom’s Training Camp is an outdoor children’s play area. It is quite large and themed with all of the characters from Tree Fu Tom. There is one entrance and one exit and on a busy day it can be quite hard to keep track on your children there as there are many places for them to run and hide. Still, if you’re happy to chase them around, it’s quite a good way to burn off steam between rides. 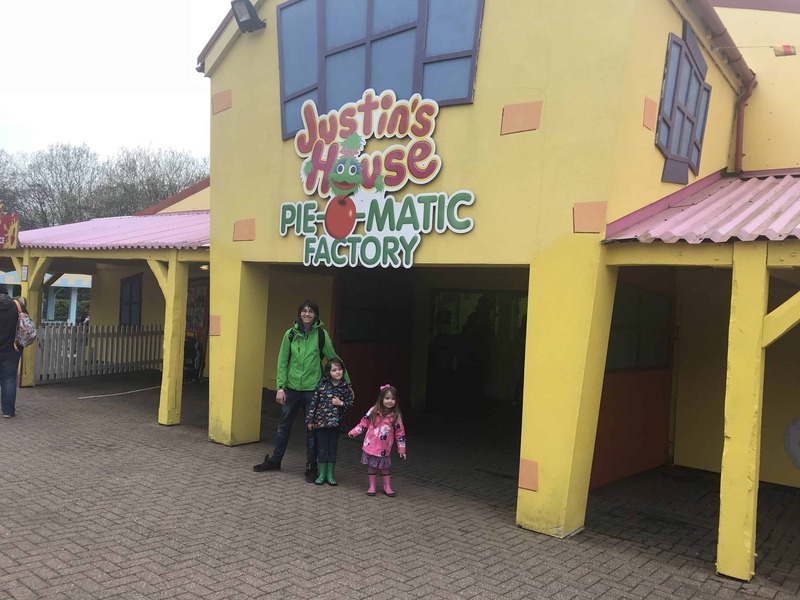 Justin Pie-O-Matic Factory is an indoor a large indoor space filled with balls that you can shoot at each other. 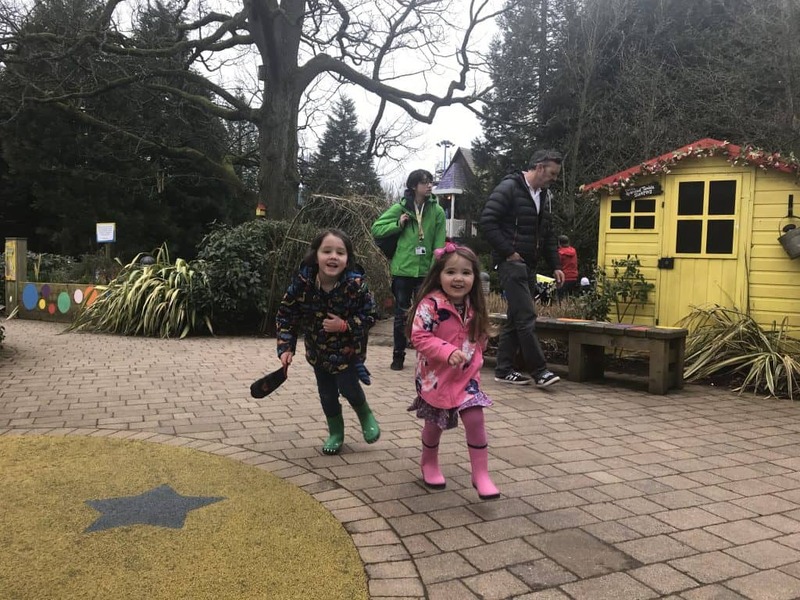 Although it was little busy and chaotic from my little ones when we went to, it can be a good place so you’re slightly older children to run around especially the weather is not brilliant. 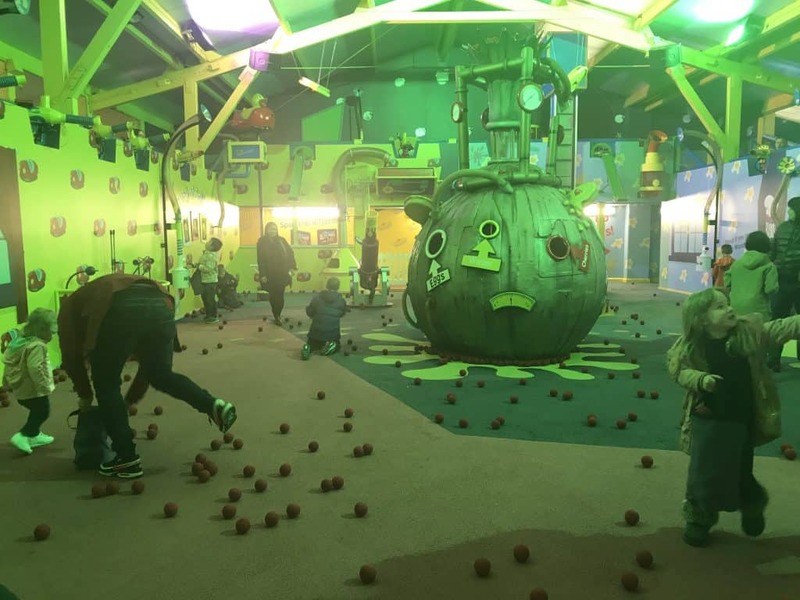 The Charlie and Lola attraction is a walk-through where your children can get involved with activities such as dressing Charlie and Lola and their dog, selecting food in Charlie Lola’s kitchen, and climbing up the castle. Although my lot were not entertained for very long by Charlie and Lola, it is a good option with little or no queue, this is at least indoors if you’re sheltering from bad weather. 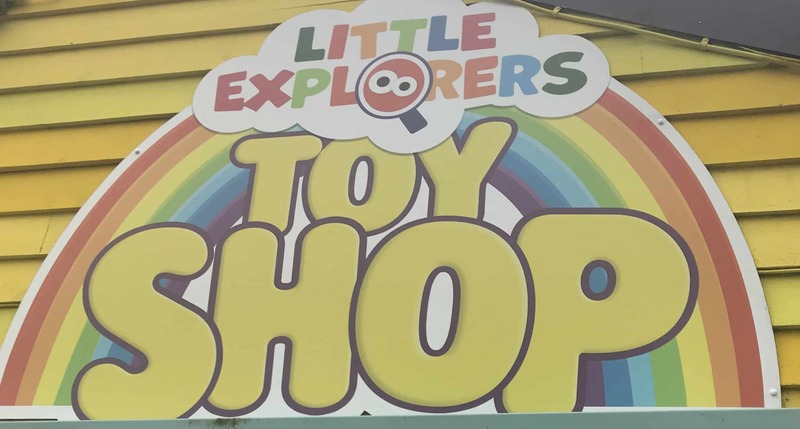 The toy shop is situated in the middle of Cbeebies Land. 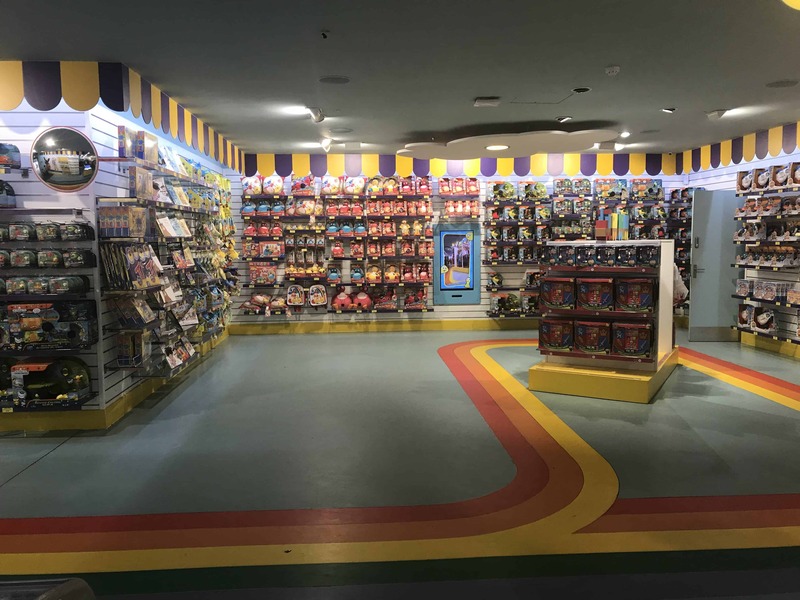 You can use the main entrance, but you will also be directed through the shop as you exit the In The Night Garden ride. The shop was filled with lovely CBeebies toys that my children “needed” desperately. Yes, we spent a fortune, but at least our Merlin Annual passes got us 10% off. 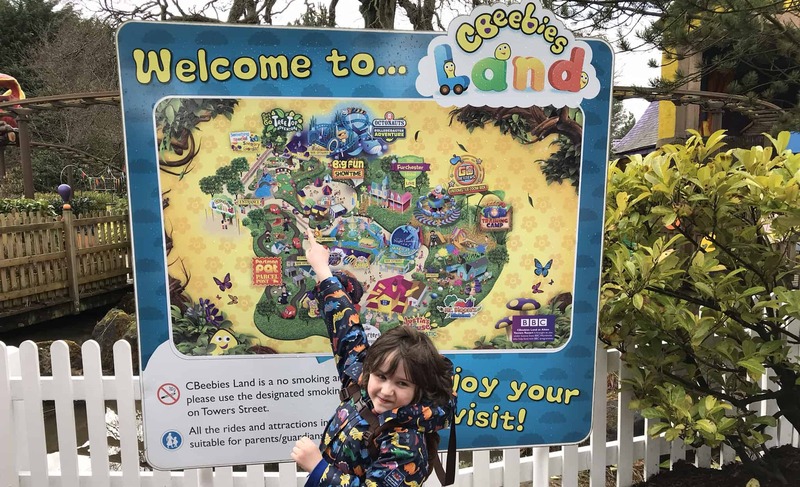 If you can pry your little ones away from CBeebies Land, there are quite a few rides and attractions in the rest of the park that are worth a visit. Here are a few of our favourites. 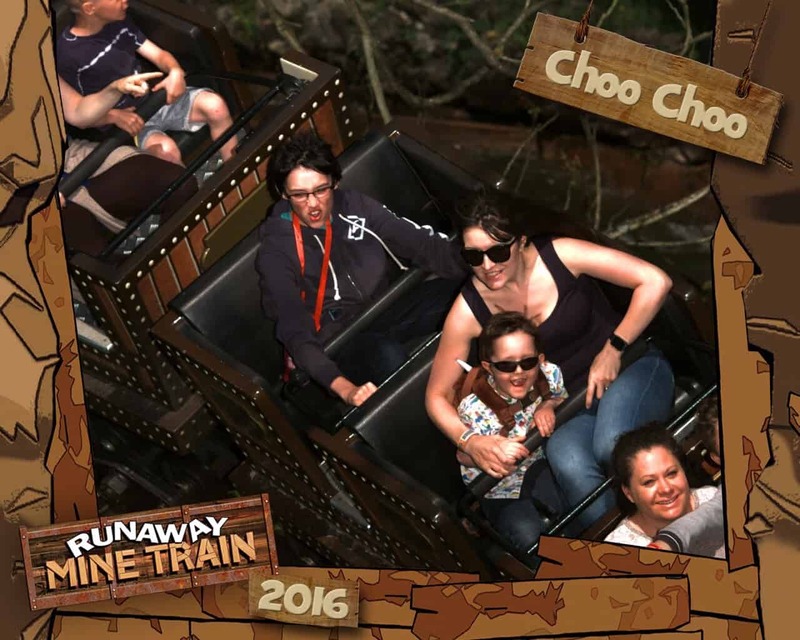 The Runaway Mine Train is another rollercoaster suitable for children from 0.9 metres tall. It is faster higher and longer than the Octonauts Rollercoaster Adventure in CBeebies land, and my 13, 6 and 3-year-olds all loved it. The Runaway Mine Train is situated over the far corner of the park, so you can take the sky ride cable car if you want to save the children getting too tired. Photographs are available at the right exit before you reach the shop. Duel: The Haunted House (or “shoot the ghosts”, as my three-year-old daughter Bella affectionately named it), is a ghost train ride where riders sit in cars are three people. Each rider has a gun where they can shoot at targets as you go through and can compete against each other to win the highest score. Don’t forget to pick up your photos as you exit the ride. Cloud Cuckoo Land is in the opposite corner of the park from the Runaway Mine Train and can be accessed via the Sky Ride cable cars if you don’t fancy the walk. It is filled with attractions mainly aimed at younger guests. 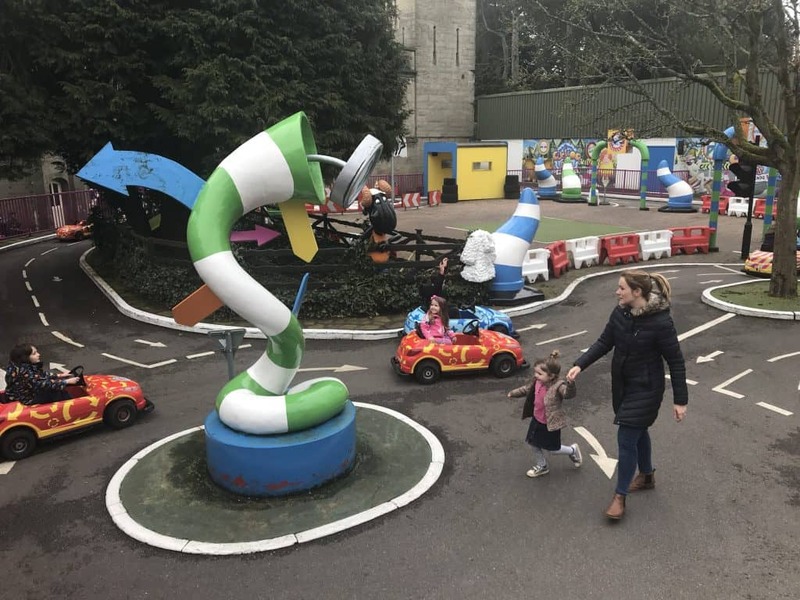 The Cuckoo Land Driving School is open to children over 1 m and under 1.4 m tall (my 13 year old was most put out that he was too tall to go for a drive). Here your little ones take the cuckoo land driving test as they drive round lovely set of roads complete with traffic signage a lovely little mini village. Near the driving school is a nice carousel suitable for all ages. This is a gentle ride that even the baby washable to go and enjoy. Other rides include the Frog Hopper and a 4D cinema. Shark Bait Reef is an aquarium situated in Mutiny Bay that was very popular with my little ones. For visitors over 1.4m there are many big rollercoasters to keep you on the edge of your seat including Galactica, nemesis, oblivion and new for 2018 The Wickerman, which is a wooden rollercoaster incorporating fire. 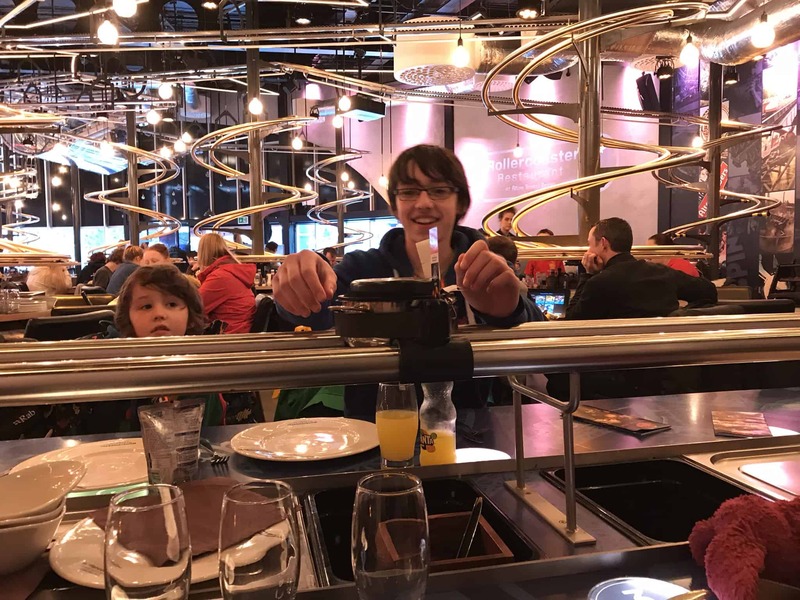 The rollercoaster restaurant is the unique dining experience which my children became obsessed with. Place your order on a tablet from your table then watch your food and drink come down the track through twists and turns and loop the loops only to arrive in front of you. The food wasn’t bad, and although it is not the cheapest place to eat, I would still say it’s an experience not to be missed. We actually eat there on three consecutive days during our last track. It does help that Merlin passes get you 20% discount off food in the rollercoaster restaurant and across the park. There’s no booking required during the day but from 5PM (when the restaurant can be accessed even when the park is closed) booking is essential. Trying to book on the day is unlikely to work, as they are generally fully booked everyday. 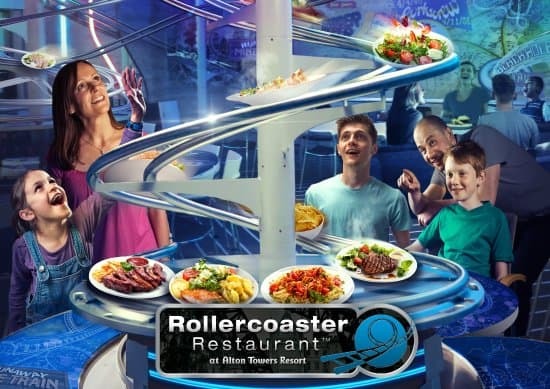 I would recommend making a reservation at the rollercoaster restaurant online a number of days before your visit. There are various places to eat dotted around the park to grab a quick bite. We used our Merlin Annual passes every time we bought food, which made quite a difference to the amount we spent over the course of our visit. Other than the days when we ate in the rollercoaster restaurant, we mainly snacked in the park and ate a main meal in the evenings. During our visit (and closing times vary according to the season), the park closed at 5pm one day and 6pm on the other days. This meant that staying in the park for main evening meals was not an option. We were lucky enough to find two fantastic places to eat that catered for families near by. Both get incredibly busy after the park closes, so booking is essential. 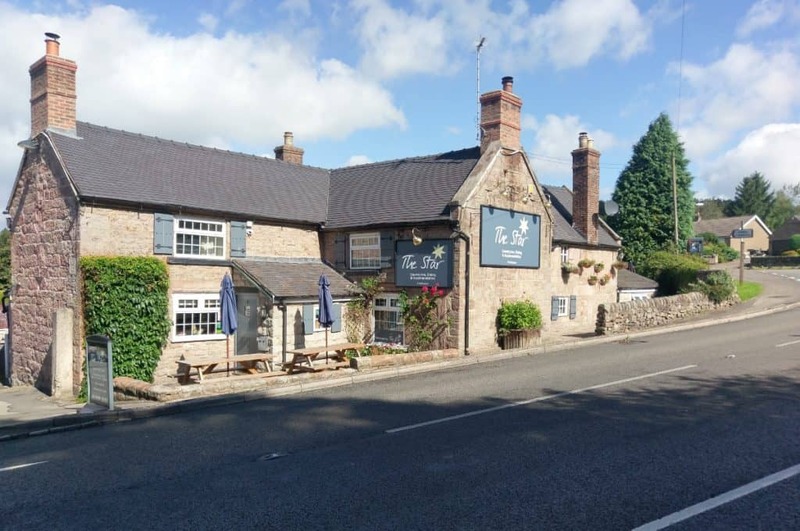 The Star at Cotton is located very close to the entrance to the park and is a very short walk from the Star At Alton Caravn & Camping Site where we stayed with our touring caravan. The food and the service at The Star, which is run by a lovely local family, was excellent. The were welcoming and accommodating and as a result we have eaten there a lot. The first time we visited in 2016, William’s eating due to ASD was so fussy that he would not eat anything that I had not prepared myself. The lovely people at the Star were so very accommodating and heated food for me that I brought each night. As a family with Autism, having placed to go that are so supportive and helpful makes all the difference. The Alton Bridge Hotel is another little gem that we found near by. We have only been there once, but we found that it was really lovely. It is a little further from the park than the Star, meaning we had to drive rather than walk from where we were staying, but both the food and the service were also excellent. 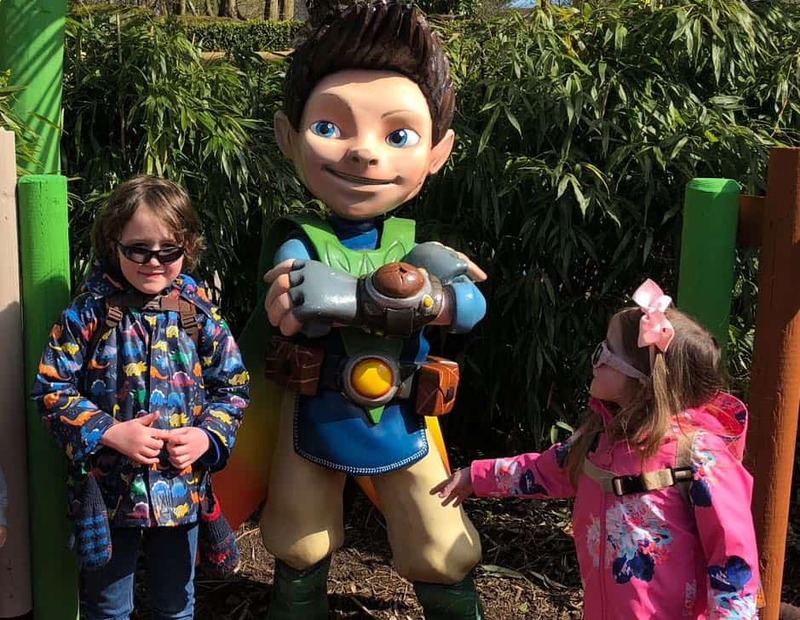 How Accessible Is Alton Towers Really? 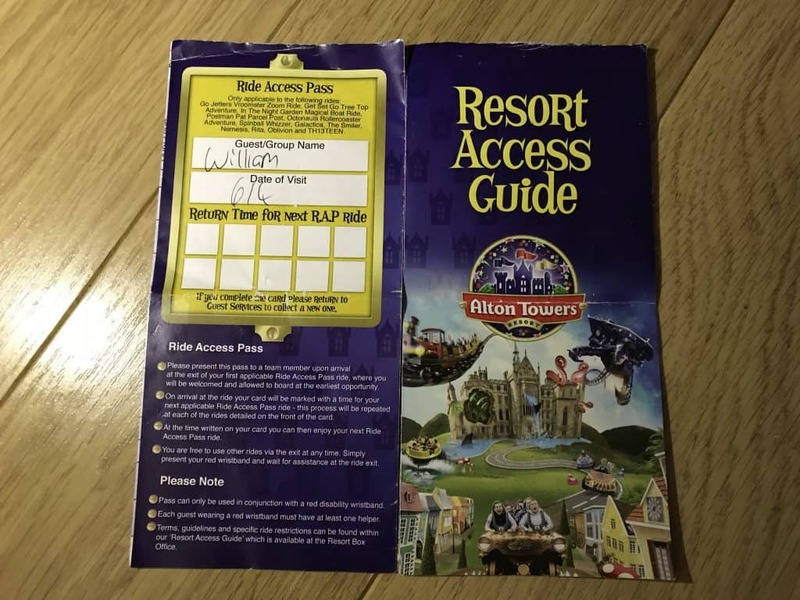 The availability of the Ride Access Pass meant that a visit to Alton Towers was possible for our family If we had to queue with the rest of the public it would have been too much far child with ASD, making a trip to the park impossible. However, they have somewhere to go the park being as accessible as need to be. Families with autism who are eligible for the ride access pass still have to queue for the monorail and then again before to get the carer’s tickets to get into the park itself. On the first day almost resulted in such a bad meltdown that we had to go home. Had been a different day that might have been how things are panned out and that day would have ended before it had began. It also seems mad that in order to get the ride access pass must join a rather lengthy queue guest services. The proof of disability documents only have to be presented once and then families are issued with a special number. Unfortunately, the only way to get the band and paper counterpart to use the rides, queueing is necessary. I suggested to the customer services manager and perhaps a photo ID card would be more effective, as it could be issued ones to the disabled person avoiding the need to visit during. She pointed out that the health and safety the red band is necessary to Identify vulnerable people in the event of a ride accident. I suggested perhaps a red card on a lanyard would be more effective and she said that she would take this into consideration. They are introducing a quiet room on Tower Street and alone of your defenders which should further help summitted autism, especially those that have struggled the sensory overload. So overall once you’re within the park and have your band I would say accessibility in Alton Towers is great. They still have a little way to go when it comes to their systems for obtaining the ride access passes and making the park truly accessibl to families with additional needs. 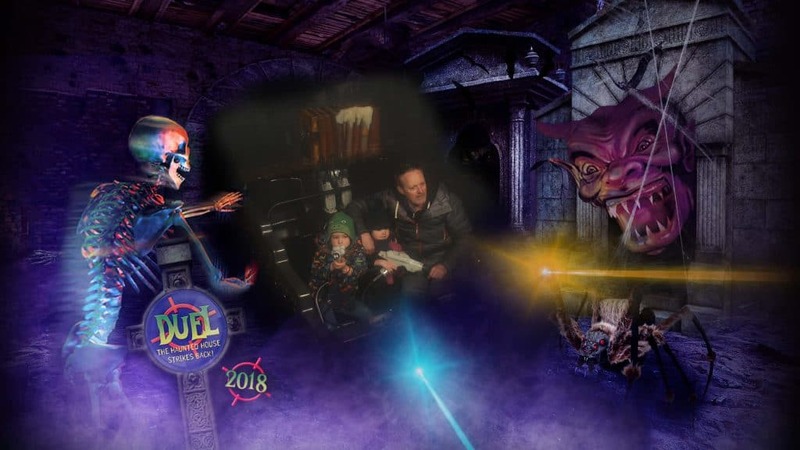 In spite of the fact that we had some difficulties with large queues and with organising our access passes on first couple of days of our latest trip overall, I would still say that Alton Towers is really fantastic family experience. CBeebies Land is just lovely. The staff, for the most part, were friendly welcoming and helpful, and the park was very well geared up to families. Annual passes were definitely a good move (especially since I paid for two with Tesco vouchers). I feel that having an annual past the pressure off the day little. When you paid for a day ticket, I feel that you need to go in first thing in the morning and stay until the bitter end, whether everyone is too tired or not, just to get value for money. With annual pass we felt less pressured to stay to every single minute, we were able to go in and out over the four-day period when we felt ready. Have you been to Alton Towers? What did you and your little ones think of it? Please let me know in comments, I always love hearing from you my lovely readers.